These mountains get in your blood. Everybody says so. 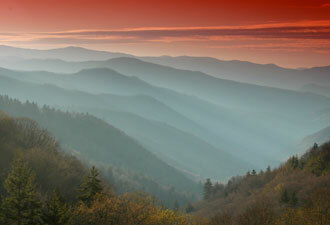 The Smokies are mountains that draw you in. Once you visit, this place feels like home. Stroll through one of the park's historic areas to find this sense of home. Bicycle past fields dotted with wildflowers and listen to the low rumble of the grinding stones at Cable Mill in Cades Cove. Pause on the steps of Palmer Chapel in Cataloochee to watch a mother elk nurse her calf. Or explore the weathered buildings at the Mountain Farm Museum. Here, the moments just before the sun breaks over the ridge are a magical time. The valley is thick with fog and the farm has a peaceful, ethereal quality. The clucks of chickens and snorts of pigs carry in the still morning air. Dawn at the mountain farm takes you back a century — it becomes easy to imagine what it was like to live in the Smokies all of those years ago. A wondrous diversity of life calls these ancient mountains home. There are over 1,500 species of flowering plants, more than 240 different kinds of birds, 65 species of mammals, and a fantastic variety of butterflies, moths, and other insects. And the salamanders! The park is known as the Salamander Capital of the World — with good reason. The Smokies have one of the most diverse salamander populations of anywhere on Earth. From mighty hellbenders, which commonly grow up to two feet long, to spotted salamanders with their cheerful, yellow polka dots, the park's 30 species of salamanders are truly amazing. Gather your kids and join a ranger-led program to search for these critters by the side of a mountain stream — but be prepared to get a little wet and dirty. Of course, you'll be having so much fun, we promise you won't mind! If you want to really get to know the park, put on a pair of sturdy shoes, and hit the trail. Great Smoky Mountains may be the busiest national park in the country, but tranquility abounds on many of the park’s 800-plus miles of trails. In the forest, the sounds of nature dominate—the rush of a cascading stream, the calls of birds, and the rustle of leaves. 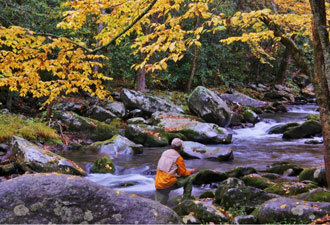 Plan a day hike or an overnight trip into the backcountry to see the Smokies in a whole new light. Enjoy a sunset from a mountaintop, feel the cool spray of a waterfall, or watch the sunlight dance on the forest floor. Prefer a little company on your exploration? 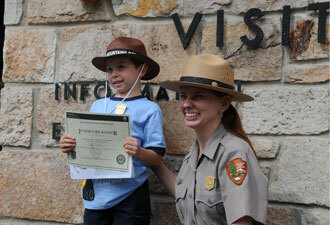 Ranger-led programs cover a wealth of topics from black bears to old-time music, bats to blacksmithing, and allow you and your family to really discover the park. To get a current listing of ranger-led programs, pick up a park newspaper at any visitor center or view the schedule online. So let these mountains get in your blood. Whether you want to marvel at breathtaking vistas, listen to an elk bugle in a misty valley, or tap your toes to music on the front porch, you will find something spectacular in the Smokies. You'll find a home.